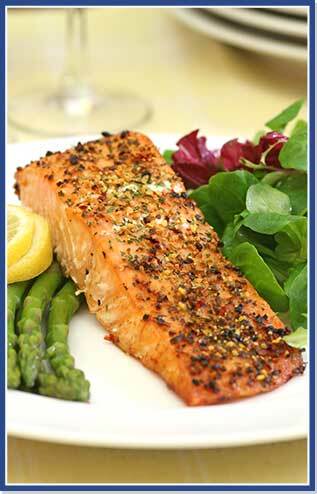 Since 1972, our chefs have been creating recipes to enhance the flavor of fresh fish. Fresh fish selections are posted around the dining room. Some days are luckier than others so quantities are limited. All of our entrees are served with the potato of the day, hand cut fries, or daily rice and with your choice of the fresh vegetable of the day, tossed salad, or coleslaw. Broiled with wine and butter and topped with a balsamic glaze and bruschetta that includes spinach, tomatoes, basil, and red onion. New to the list! Grilled with salt and pepper, then brushed with lemon caper butter. Coated in coconut, almonds, and pecans, with a dash of cinnamon and topped with our homemade lobster cream sauce. Seared with blended mint dill and olive oil, then topped with fried spinach and feta cheese. A spicy, full -bodied blend of dried peppers, seared on cast iron and topped with fresh salsa. Our own blend of fresh lemon and basil, grilled to perfection.